Three Anniversary Albums will be released on her debut date, April 22nd. Anna Saeki, living in the moment, expresses dreams, hopes, courage and love through her music. Anna Saeki’s music reaches people in other countries and echoes through the universe. These albums were recorded with the band led by three unique world famous maestros. In addition to original songs written by Anna Saeki, she breathed new life into her collection of songs with new arrangements and her translation. Please enjoy Anna Saeki’s delicate and gorgeous voice which was once described as “like perfume” by Horacio Ferrer, a great poet of Tango music. From Tango to a rather new world, Anna’s trajectories in creating her music was led by various miraculous encounters!! 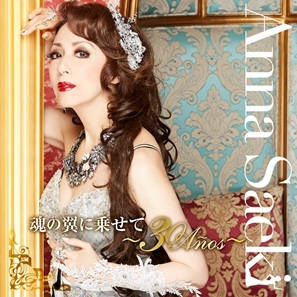 Anna Saeki delivers “On the Wings of the Soul” to you. With love and wishes, Anna Saeki presents her world to you, bringing this moment to further evolve together. I would like to express my sincere appreciation to everyone who has supported me and to those I’m meeting for the first time.